It’s not my son’s fault or that my wife and I are bad parents. As our neuro-psychologist likes to say when she simplifies things for me: The wires in his brain are a bit jumbled and crossed. 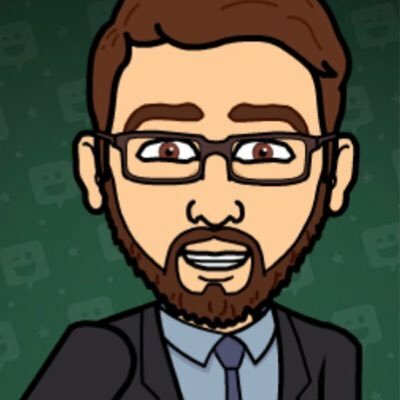 My son is adopted from the foster care system and, as with any child that’s been in the foster care system, he has some trauma that he needs to overcome (I’m not just referring to the trauma of being in foster care, but more so the trauma which got authorities involved where the child is subsequently taken out of the home). 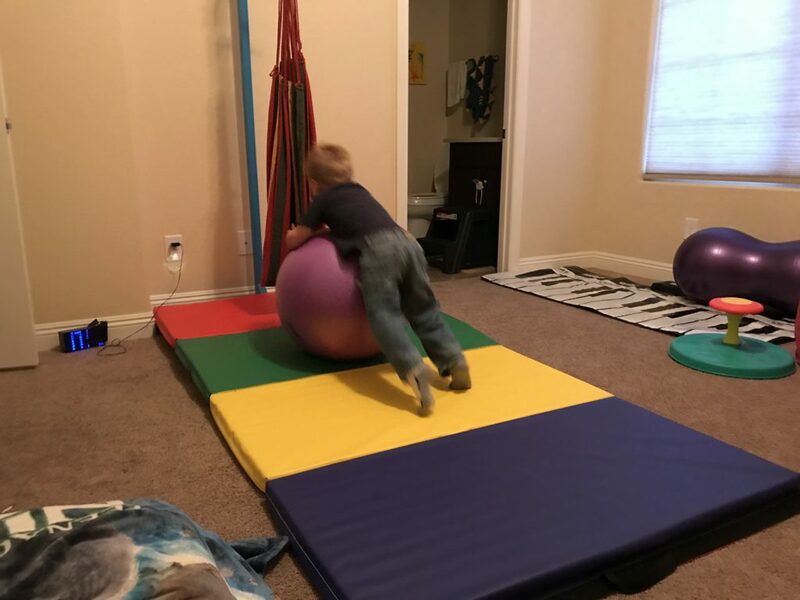 I’ve touched on my son’s trauma in my articles on the therapy swing we got him and how I’ve been using the therapy swing to teach my hyperactive son to read. It’s very hard for my son to transition from one activity to another, or more accurately, its very hard for him to transition from one emotional state to another. This is most apparent when he gets hyperactive. Once my son gets hyped up, its extremely difficult for him to calm down. And often the next state after hyperactive would be a rage tantrum. There are definitely no words that can change his state. You can’t tell him that he’s being hyper and needs to calm down. He may hear the words and acknowledge them, but there’s no change in behavior. Once he’s in a rage state, he can’t even hear words, and it’s pure physical action at that point (part of our definition of “rage state” is where even if the problem was solved or he got what he wanted, he still wouldn’t be able to calm down). We have been working for a long time on breathing techniques – taking deep breaths. Initially, though we would practice breathing while he was in a calm state, he would still refuse to try breathing once hyperactive. So we tried activities that involved deep breaths like blowing bubbles and blowing up balloons. Most often those activities just amped up his state. But we’ve been taught that consistency is key, and now that he is starting to mature a bit, we have recently, at the budding age of five, started to have some success with deep breaths. And we still do the balloon blowing/bubble activities when he’s not hyperactive or raging to practice deep breaths. Beyond breathing though, it would usually take a major physical intervention to get him to start to come down, especially from a rage state. Though I have wanted to spank my son MANY times, especially after he’s physically attacked me in a rage tantrum, I’ve never spanked my son (another article yet-to-be-written: *follow me*). Thus, most often, the physical intervention that finally brings him down, is when he gets so out of control that he hurts himself. And I’m not talking about a small bump. It needs to be enough of a physical blow such that the tears start HEAVILY flowing. And my son has a very high pain threshold, especially when excited, so we’re talking injury to the point of lumps, bruising or blood flow. Also, as far as self-regulation goes, when my son gets tired, he doesn’t shut down, he just gets even more hyper and further out of control. In his hyperactive state, as I wrote earlier, he doesn’t listen well. He just does his own thing. He can’t process instruction. And if you try to physically restrict him from doing something, he will often go into a physical rage state where he will aggressively attack by trying to hit, scratch, and even bite you. Below is a picture (extreme close up… wow!) of my eye after he got me during a rage tantrum. Luckily I was wearing sunglasses which protected my eyeball from being damaged. My wife, who is legally blind in one eye now wears glasses to help protect her good eye (partly because of incidents like these, and party as a decision in regular life outside of these incidents). The picture above is not extremely rare. I have a bunch of pictures in my archives with scrapes and bumps I’ve received. 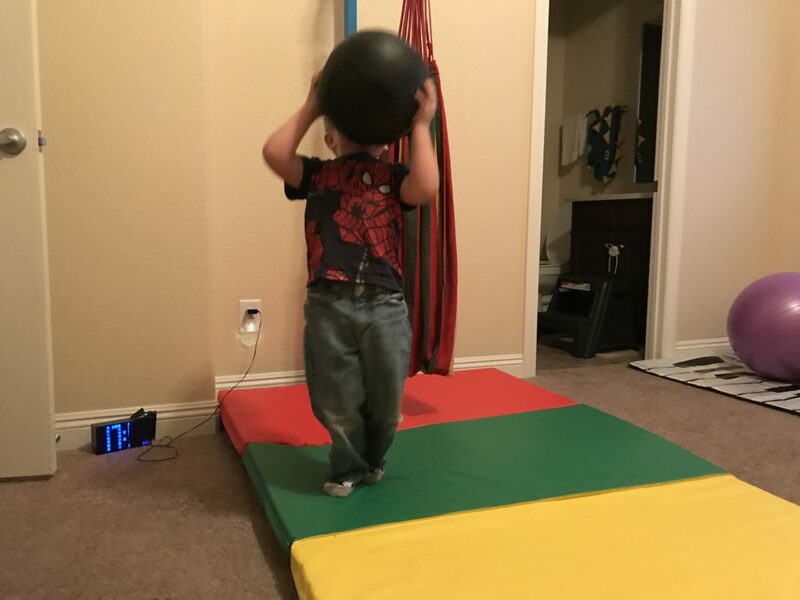 I briefly touched on how he nearly broke our nanny’s nose in my post on teaching my angry (ODD) hyperactive (ADHD) son to read. And it’s not that he just happens to accidentally hurt in some way while flailing in anger. When he gets into a rage, he intends to hurt. Interestingly, thanks to my life with a “strong-willed” child, I can begin to understand the victim’s side in an abusive relationship as I still tell myself that this incident was my fault… Had I been aware that his nails were getting long, I wouldn’t have gotten hurt. Funny note for anyone reading (not for me): At one point my son learned, by accident, that he can take me down with a hit to my groin. And from then on, when he got into a rage fury, he would immediately go for my balls. So now, I’m classically trained in that anytime I see the fury start in my son, I put one hand over my crotch. Personally, I have to give the kid credit; he’s scrappy. And I often try to justify his “fight response” with existentialism (if that’s the right word), believing he is only alive because in the womb he fought to live. Having been pummeled by the amount of chemical and physical abuse he prenatally experienced, were he not a fighter, I believe he would not be alive. So when our son would go into a rage state or gets hyperactive, as part of self-preservation and for protection of the greater areas of our house, we try to get him in his room. Realize that these rages would seemingly come out of nowhere. Simple requests like “you’re holding yourself, go potty”, “stop jumping on the couch”, “pick that up” (something he threw), “go play in your room”, “I’m turning off the tv now” (even after multiple warnings it was coming), “be gentle with the dog; that hurts her”, “clean up these toys”, “it’s time to go home” (when at the park) could quickly escalate him to his rage state. Pretty much any request where he wasn’t allowed to be in total control could lead to a rage tantrum. And to answer your question: NO, once raged, hugging, holding, calm voice, soft touching were not ways to help stop the rage. But yes, the goal was to always stay calm and not escalate along with him (not easy to do). We’ve learned that understanding his “triggers” are needed, such that we can focus on prevention mechanisms like “redirection”, “extinguishing a behavior” (ignoring), “positive reinforcement of desired behaviors”, “using understandable phrasing for requests vs must-follow directions”, are (just some of the) keys to avoiding escalation (another article yet-to-be-written: *ways to follow me*). When he would rage, getting him to his room was always very difficult, because he can’t hear anything in that state, so we couldn’t tell him to go to his room. And we would have to physically stop him from his physical destruction and secure him (pick him up) to take him to his room. The physical restriction would just increase his rage. He would lash at us as we carried him to his room. I even developed my own technique to carry him so that he wasn’t able to hurt me while carrying him (another article yet-to-be-written: *follow me here*). Once raged, he would begin to damage his room by throwing just about anything, from toys to chairs. 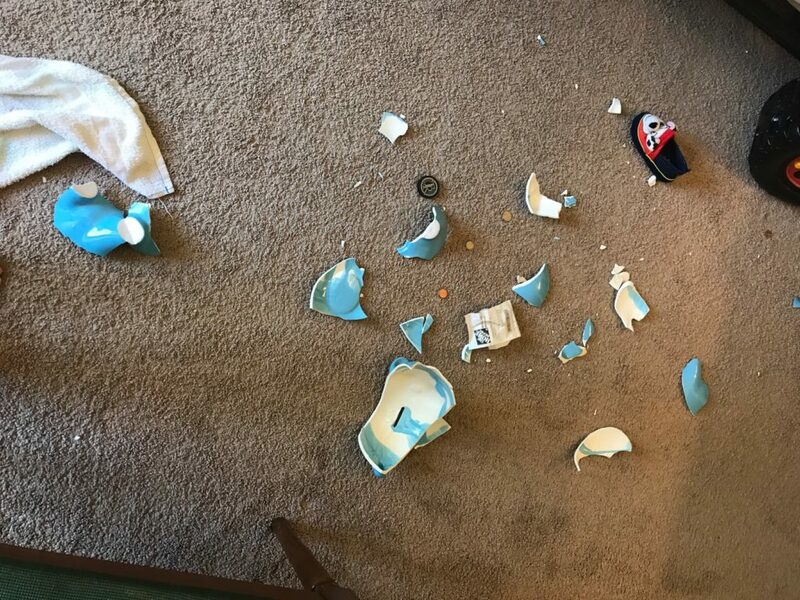 Below are the shattered remains of an engraved ceramic piggy bank he was given on his adoption day. He deliberately smashed it on the floor during one rage tantrum (our fault for having something of sentimental value in his room, right?). Usually, once in his room, his aim of fury and objects was directed at the door. 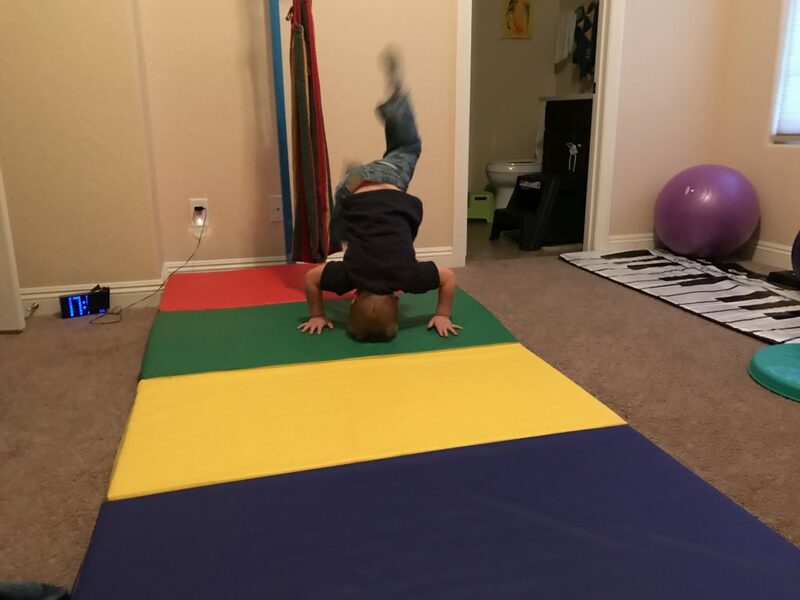 He’s done this since he could walk and he’s now just budding on five years old. Over the last year, thanks to a plethora of therapy and some maturity (finally! ), the physical rages have decreased significantly. However, they used to be so often and so strong that, with the approval of our neuro-psychologist, we emptied out the small walk-in closet in his room to be a “safe area” and we would put him in the room such that he could rage in the empty room without hurting himself or without breaking things until he burned himself out. Of course, when we’d put him in there, we didn’t close the door. We would sit on the other side of the doorway, usually with a big yoga gym ball in the door frame. I’d like to say we always had eyes on him, but often just seeing us look at him would enrage him further, so we would have to sit on the other side of the ball with our backs to him. 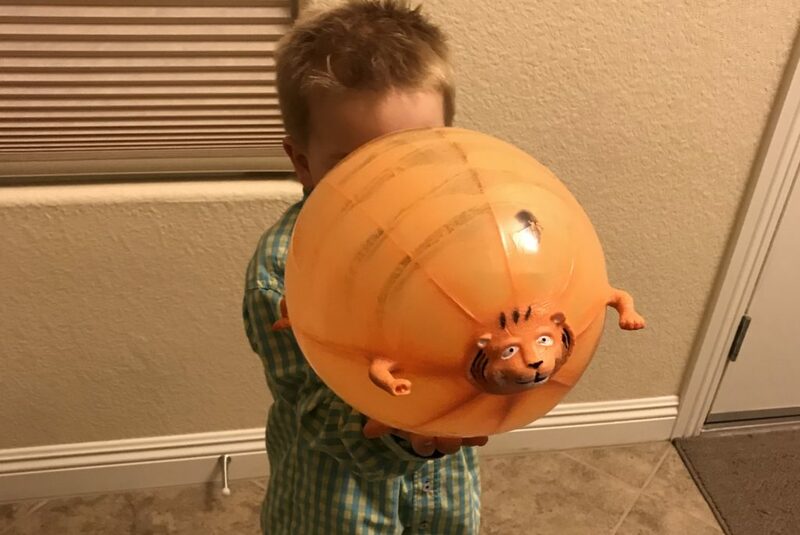 He would yell and scream at us and try to attack, but couldn’t reach over the ball, so ultimately he’d just put his fury into the ball until he wore himself out. It felt like he would rage for twenty to thirty minutes, but when we finally started timing, they were actually around five minutes. 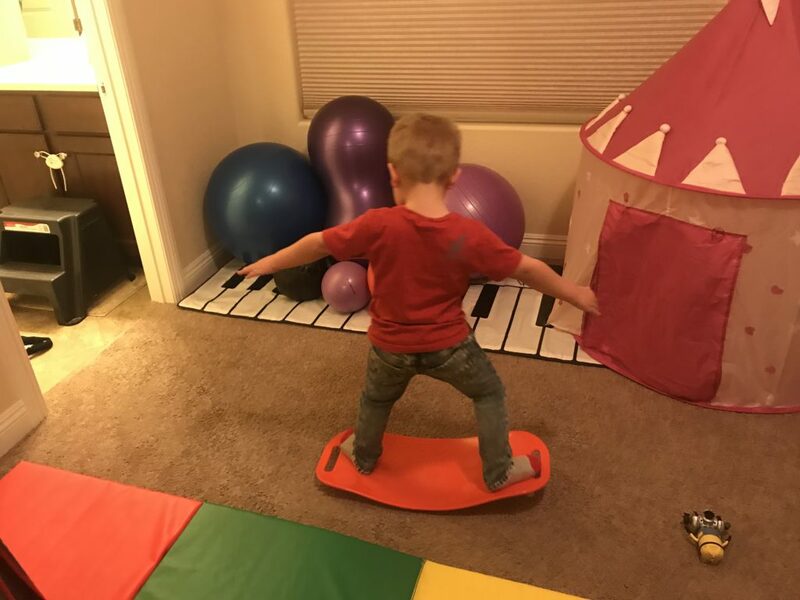 As far as hyperactivity goes, a few months ago, my wife realized that we had too much stuff in his room and that his room was just too dangerous for his constant need for motion. 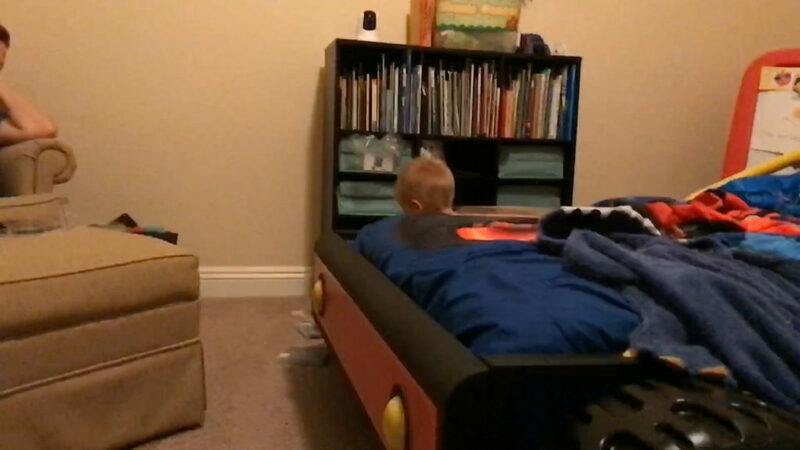 He was continually jumping around his room, often from his bed to his chair and vice versa. 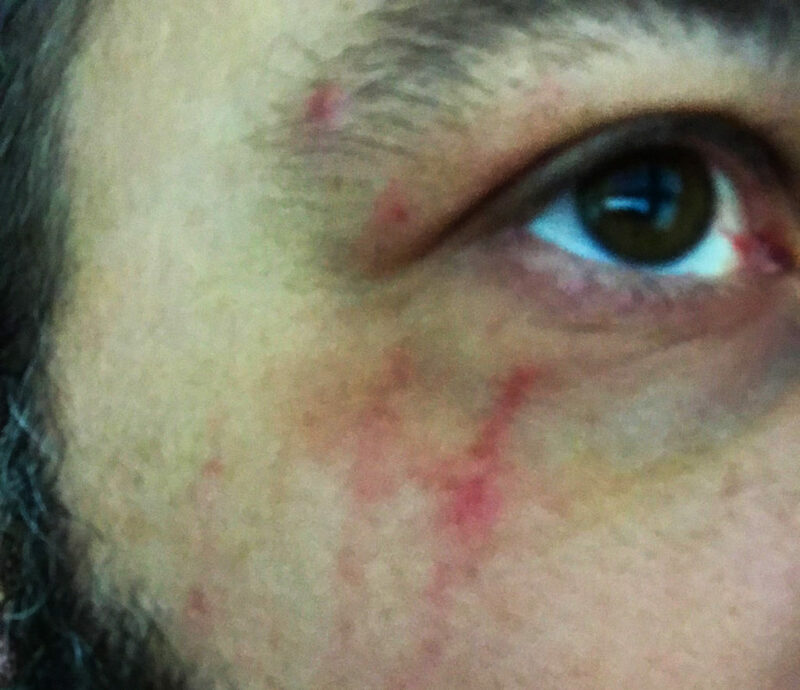 A good friend handed down a metal car frame bed, and his antics started to get dangerous where he’d either bang his head on the unforgiving metal frame or hit his shin or ankle on missed jumps. 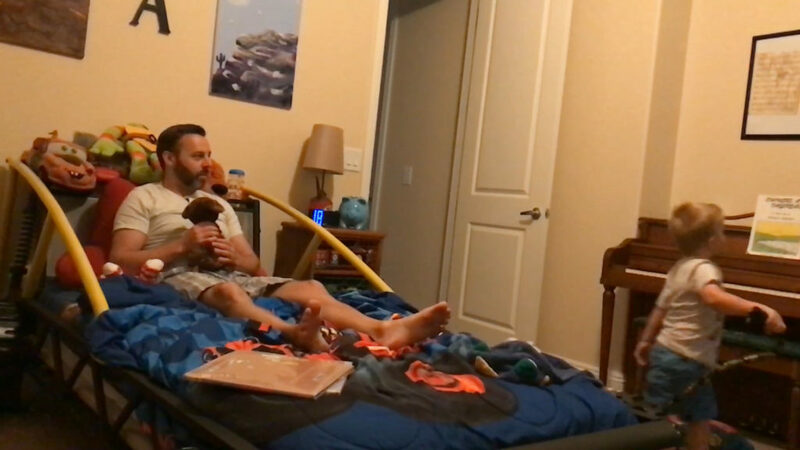 I didn’t take a picture of the room in its “before” state, but below is a screenshot from a video where you can see how the bed was right next to the chair and how enticing it would be to jump from one to the other. Heck… I even wanted to do it at times. 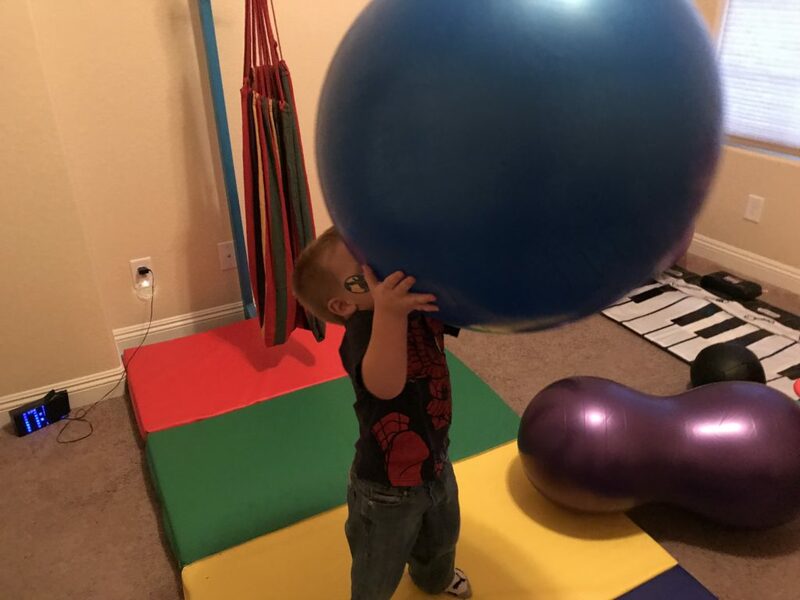 Trying to appease an audible portion of his sensory system (he’s been diagnosed and is being treated for sensory processing disorder; another article yet-to-be-written: *are you following me yet? *) we even had a small piano in his room. We put it in there because it’s a family heirloom with lots of meaning for my wife that she wanted to keep but was willing to let take a little abuse if it helped. Also, at the time, we couldn’t find a better place in the house (hence the justification). Finally my wife, always the one trying to do better for our son, decided we needed to make his room a safe place where he can get his energy out safely. 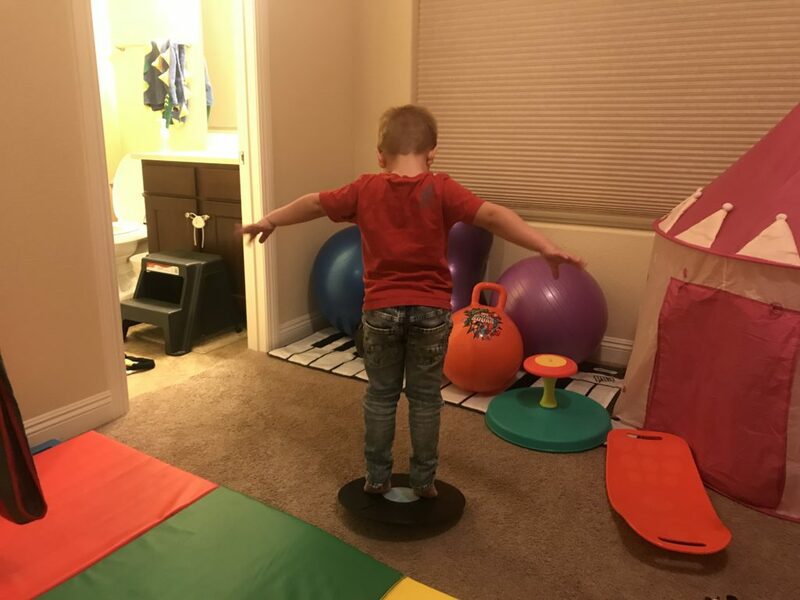 Thus, we turned his room into a “therapy” room where he could “be himself,” and wouldn’t have us constantly tell him to stop jumping off the bed. We took out the piano and replaced it with a Click N’ Play Gigantic Keyboard Play Mat. We removed the bed frame, and his bed is now on the floor; he’s allowed to jump on it all he wants. 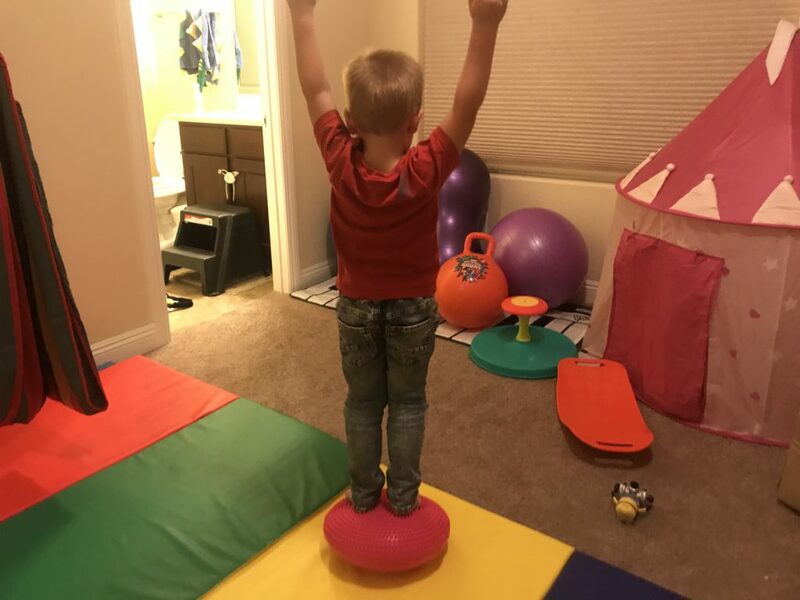 We filled his room with soft, active items. 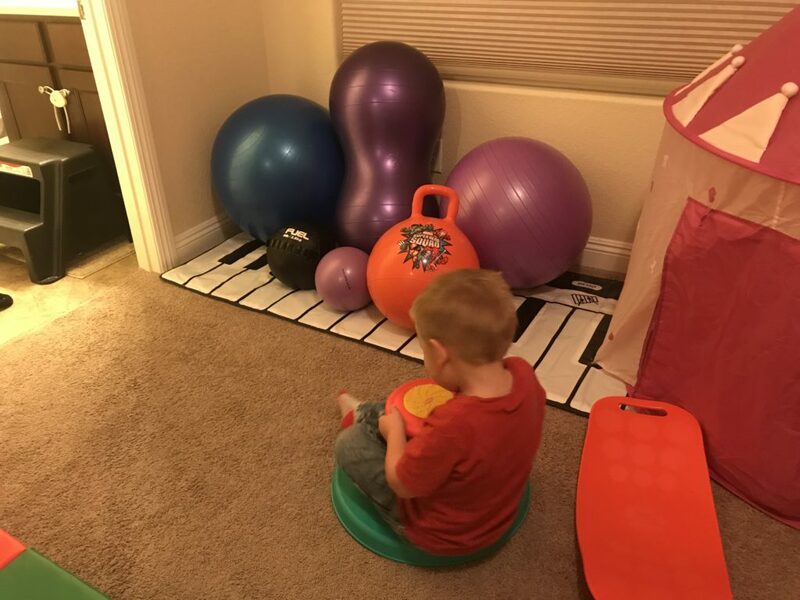 We got him a folding gym mat and a bunch of gym balls in various sizes. 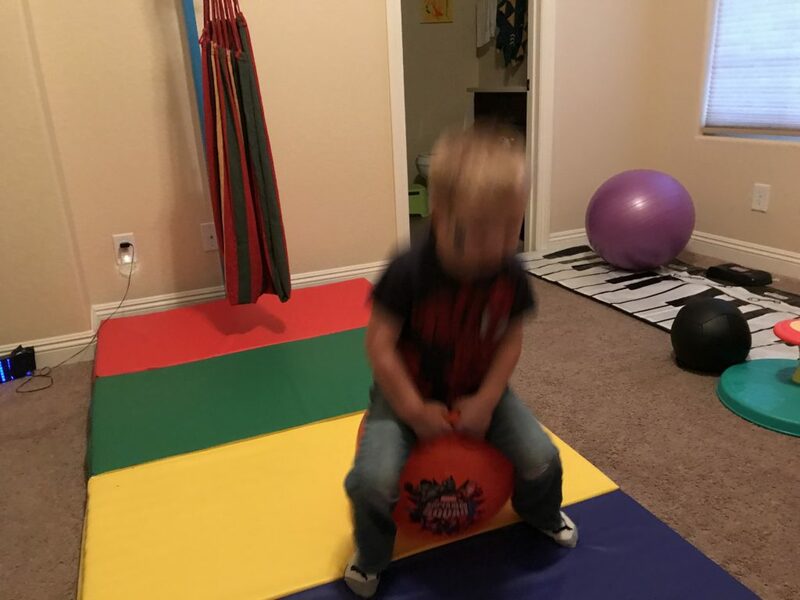 There’s a medicine ball for “heavy work” (part of his sensory therapy). We also bought various balancing objects. 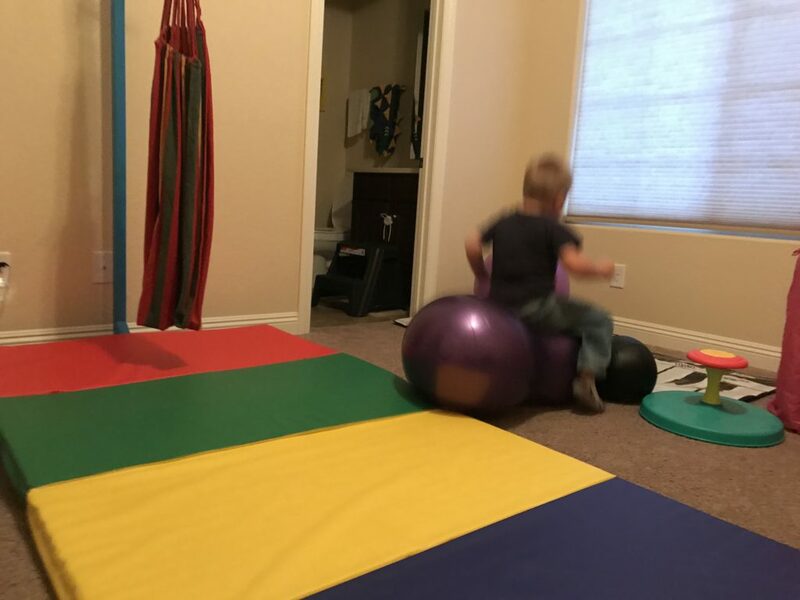 There are a Sit ‘n Spin and a Hippity Hop ball. 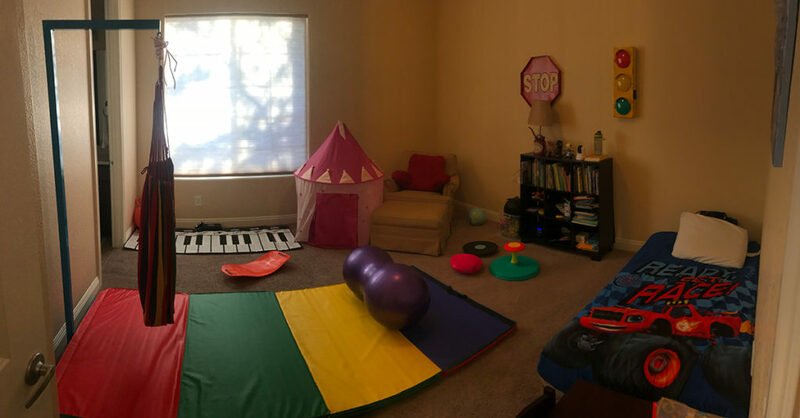 The pink castle (hand me down) is his sensory “calm down” area (or “cozy corner”) where he can go and be alone when he needs the sensory deprivation. There are even some cheap sound-muffling headphones we got at the dollar store for him to put on if his auditory system gets too overloaded. And we even put in a therapy swing. Here is a picture of his room now. 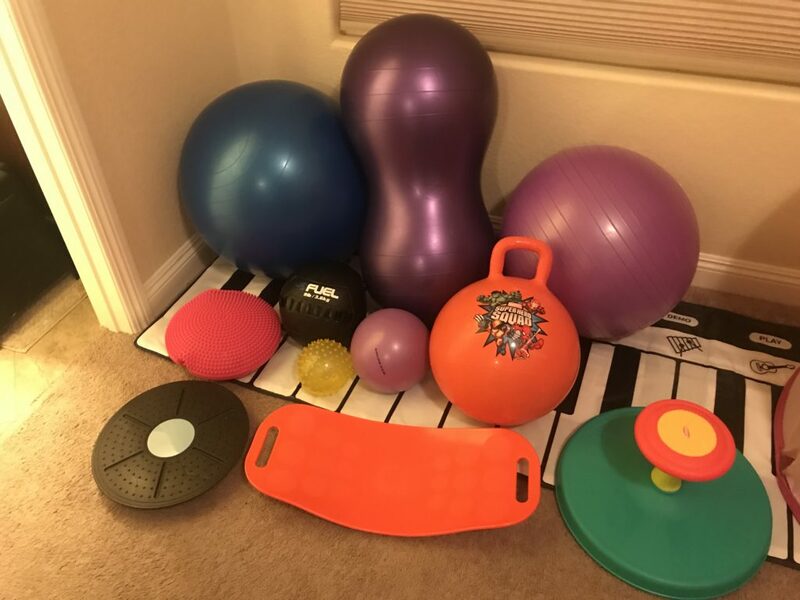 These are the various balls and balancing items we purchased for his active sensory “therapy” room. NOTE: Prices shown were at the time I purchased. Some have gone up significantly, but do seem to fluctuate up and down over time. So this has been working fairly well in that we can send him to his room to get some energy out when he’s hyperactive. Relative to the amount of money lost on broken items, the cost to change his room over wasn’t too outrageous. Oh and we don’t keep all the items in his room all the time. We switch them out every so often.